Earlier this year, I made a decision that I was going to start eating more fish – partially because I’m trying to eat a healthier diet in general, and partially because I wanted to challenge myself by going outside of my culinary comfort zone. It’s not that I don’t like fish. Quite the opposite, really – I’m pretty sure that being half-Portuguese means a deep and abiding love for salt cod is coded into my DNA, right next to the genes that resulted in my unmanageably thick curly hair and my tendency to use my outside voice even when indoors. I’m getting better at it, though. There have been a few experiments – some good, some not so good, and even a few I’d consider an outright success. One of my new favourites is these parchment packets. I suppose I could have made them sound fancier by saying they’re made “en papillote”, seeing as saying anything in French automatically makes it a million times fancier, but the fact is that this isn’t a particularly fancy dish as far as I’m concerned. When you wrap it all up in a parchment pouch, though, something magical happens – the paper traps all the moisture, steaming the fish in its own juices, leaving it perfectly flaky and moist and deliciously flavourful. And did I mention that the whole shebang is done in just about 30 minutes, including the time it takes to bake? Not too shabby. Add a sprinkling of fresh parsley, a simple rice pilaf and a green salad, and you might just find yourself wondering why you don’t eat fish more often either. I make this recipe with wild cod fillets, but any firm, mild white fish will do - tilapia, halibut, haddock and snapper are great alternatives, or even a more delicate fish like sole. For a fancier presentation, the fish filets can also be baked in individual packets, rather than a single big one as I did here. Sprinkle the cod fillets with salt on both sides. Lay an 18" long sheet of parchment paper on a large baking sheet, then arrange on the lower half of the parchment paper. 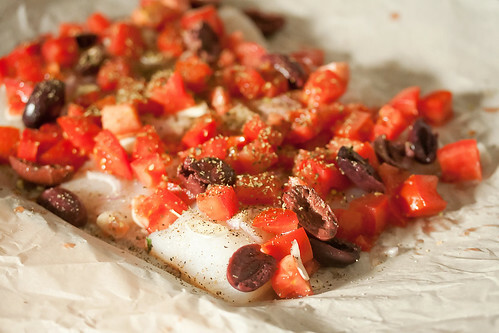 Top the fish with tomatoes, olives, shallot and garlic. Sprinkle with pepper and oregano, then drizzle with wine and olive oil. Fold the upper half of the parchment over the fish, and crimp the sides tightly to create a rectangular pouch. To serve, carefully open the packet (remember... it's full of hot steam!). 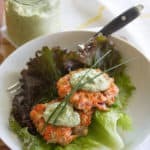 Transfer the cooked fish to individual plates, topping each filet with a generous amount of the tomato sauce and a sprinkling of fresh parsley. Just made this – amazing in both simplicity and taste. Thank you for posting! I rarely make fish at home. It seems complicated to me even though it can be so simple. This recipe sounds like something even I could succeed at though! It sounds great! This looks so good. I love the colours and I bet it tastes amazing. That fish looks fantastic! Very fresh and healthy! Congrats on Top 9!!! Great recipe! I’m just starting to get comfortable with seafood and haven’t cooked it at home before. This seems like an approachable way to start. Thank you!!! 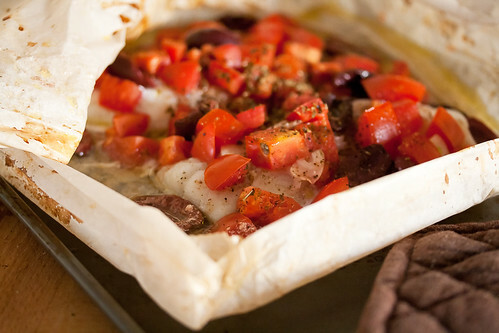 Yes, I agree, en papillote is one of my favorite ways to eat fish. 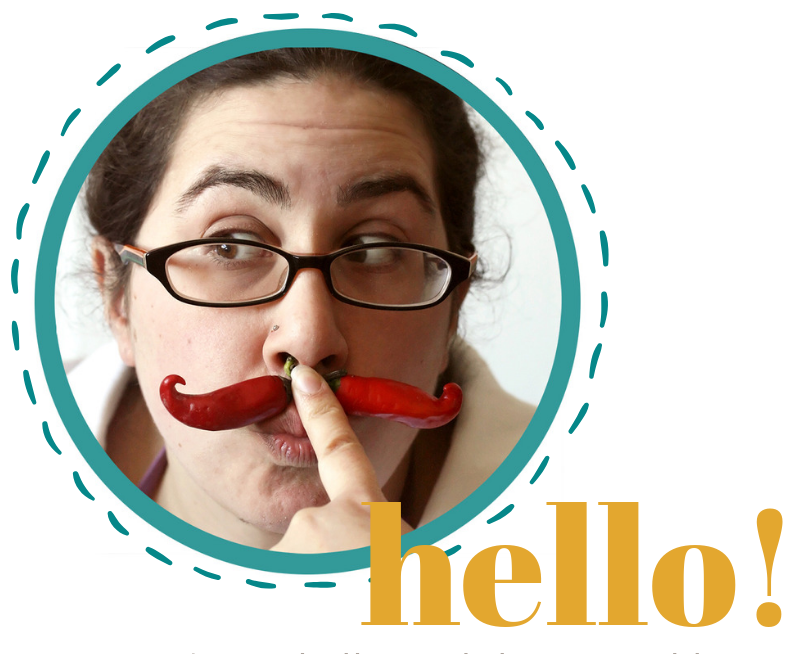 Don’t you enjoy the facial you get when you open the parchment pouches? 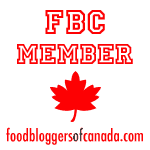 Also, congratulations on making the foodbuzz Top 9! I’ve never tried making this using this method…definitely must give it a try! 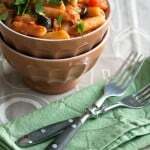 The perfect dish: healthy, easy, tasty!! Thanks for sharing! This is exactly the kind of food I love to make, and look at. Simple, easy and fresh. 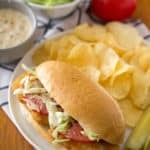 This is such a wonderful recipe and I can’t wait to try it. Sounds so simple yet delicious! 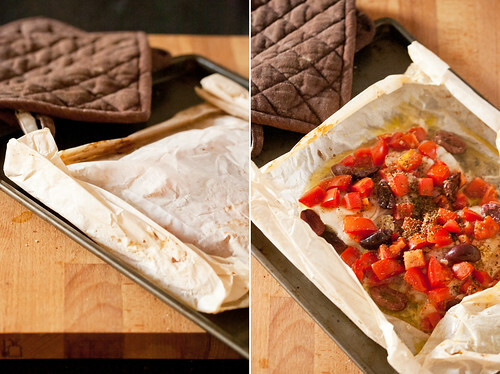 I have yet to try baking fish in parchment but it’s about time I finally get around to it! If it comes from a parchment package – I mean, en papillote – I’m a fan. In the winter I do fish in the oven. But at this time of year? We put parchment packages of fish and other tasty bits on the grill – with a little tinfoil underneath to protect from… fire. And asparagus in a parchment package? Yum! 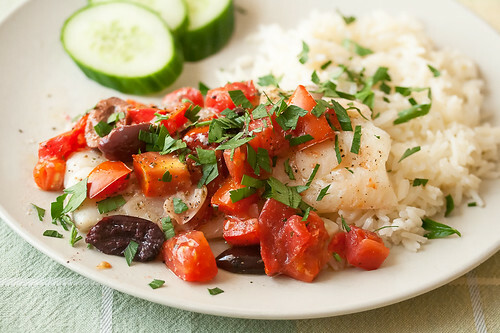 Your cod – with the tomatoes, olives and wine – sounds brilliant. I’m betting it is juicy, with the just the right acidity. Yum! And since we plan to grill all weekend? Timely indeed! My mom has had to watch her cholesterol for the past few years and has thus begun to incorporate more fish into her diet. The more I hear her talk about what she has for dinner, the more I think I should at least *try* to eat more fish. 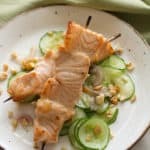 Unfortunately for me, I once had a terrible experience trying to cook salmon that left me slightly scarred [I twitch when I walk by the beautiful coral-colored filets in the seafood section of the market]. So, my idea of “eating fish” is ordering fish tacos when I go to the Latin-fusion resto down the street from me. I’m pretty sure that’s not exactly heart-healthy. I appreciate that you used clean flavors and cod because I grew up eating it and have watched my dad, an avid fisherman, cook it countless times. I will definitely give this a try with oregano from my garden and report back!